The 784,000 s.f. Class B office/data center was 87% vacant following the departure of the lead tenant. The building suffered from a fringe CBD location, above-market operating expenses, deferred maintenance, dated common areas, a bland exterior and a lack of identity. Develop marketing and management strategies to increase occupancy by capitalizing on the building’s unique data center infrastructure. The property was renamed and repositioned as the Southwest’s premier telecom/data center hotel. More than $4 million in upgrades and deferred maintenance brought the physical property into compliance with its new position. Riser capacity was expanded by reconfiguring existing mail chutes and abandoned data cable chases throughout the building. Additionally, plans were developed which would enable the use of exterior chases located between the marble face and concrete structure to accommodate future tenant growth. Reconfiguring the electrical switchgear that feeds the building’s central plant increased the capacity of generator backed up chilled water production to 4,800 tons. Doubling the previous capacity of 2,400 tons. Diesel fuel storage capacity was increased by installing additional storage tanks to bring the current fuel storage capacity to 60,000 gallons. Fuel filtration systems were added in order to properly treat and maintain this quantity of stored fuel. Further plans were developed and accommodations made to allow for further capacity increases to a total of approximately 120,000 gallons of fuel. Tenant generator locations were designed and added to allow for the installation of 10 dedicated tenant generators ranging in size from 150 Kilowatts to 1.5 Megawatts. Adding to the building’s existing 6, 1.2 Megawatt generators. The building automation system was replaced with a state of the art automation system while expanding its capabilities to include monitoring of critical building and tenant systems. Enabling a reduction in response times in the event of an unfavorable environmental condition. A targeted marketing campaign was launched towards data center and telecom tenants. An aggressive pricing plan was established, increasing rental rates to a level comparable with Class A buildings. By 2000, the occupancy had increased to 94% percent, with rental rates exceeding average downtown Houston Class A rates by 35% percent. Leases were negotiated with telecom and data center tenants such as MCI, QWEST, MFS, MFN, Teleport, Allegience, Timer Warner and ExxonMobil. From 1995 to 1999, operating expenses decreased by 23% while occupancy increased from 45% to 99%, and tenant satisfaction scores increased from 50% to 95%. 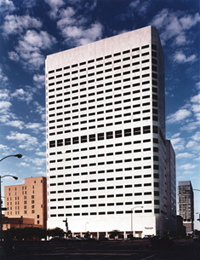 Won the BOMA - Office Building of the Year Award in 1998, 1999 and 2000. Awarded the Jones Lang LaSalle Most Improved Property of the Year in 1996-1997 and the Property of the Year in 1998-1999. Consequently, the building sold twice since 1997 and its value soared from $17 million to $84 million.